You need an assessment tool that gives your law school an edge. Lucky for you, ExamSoft is that tool. 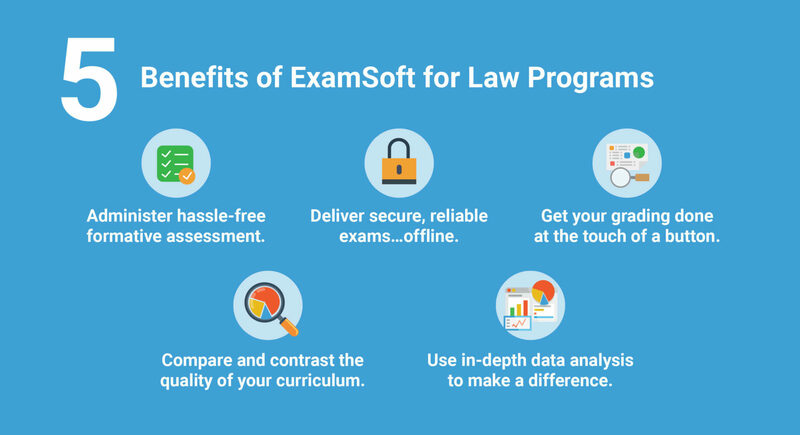 With a combination of easy formative assessment creation, secure offline delivery, and immediate data analysis, ExamSoft not only helps you properly manage precious teaching time, but it also makes sure that your law program is providing an effective learning environment that produces quality lawyers. The tasks involved with building exams can be tedious, to say the least. ExamSoft helps your law program meet ABA Standard 314 by allowing formative assessments to be created at the touch of a button. In partnership with leading publisher Wolters Kluwer, ExamSoft presents legal educators with premade formative assessments designed to provide the specific feedback law students need to make learning improvements on the spot. We hate to break it to you, but it’s inevitable: law students will be tempted to cheat. ExamSoft helps faculty battle roaming eyes and attempts at academic dishonesty with software that locks devices and restricts access to the Internet. No Wi-Fi? We’ve got you covered. The offline feature ensures that you’re delivering exams in a reliable testing environment. Choose from multiple settings, including question sequence randomization and answer choice randomization, to create an exam experience that’s as secure as possible. Get your grading done at the touch of a button. Going stir-crazy trying to find time to grade exams? Get more freedom with instant grading. You read correctly: once students have completed an ExamSoft assessment, a simple click is all it takes to complete scoring of every exam. Need to adjust scores due to an exam question error? No problem. Review assessments with the option of making adjustments to grades, creating a scale, and assigning grading criteria for essay questions. Compare and contrast the quality of your curriculum. When it comes to being a successful educator, it’s important to be able to accurately measure what’s being taught. ExamSoft offers a Category feature that supports curriculum improvement and demonstrates student learning to accreditors. Legal educators can easily tie specific curriculum outcomes and even accreditation standards to exam items to ensure that students are being properly prepared to take on a career after college. Use in-depth data analysis to make a difference. Hours spent pouring over assessment data just isn’t the best use of your time—especially if that data isn’t easy to understand. Our reporting tool provides easily digestible, in-depth data analysis that measures student performance from beginning to end and every test in between. Choose the Reporting/Scoring option from the drop-down menu on the Assessments home page to view reports ranging from Item/Question Analysis to Strengths and Opportunities, all of which help you provide the personal feedback your law students need to make data-driven improvements and lead successful law careers.